While in Afton I’ve been alternating one or two days of work on a textbook with a day of skiing. 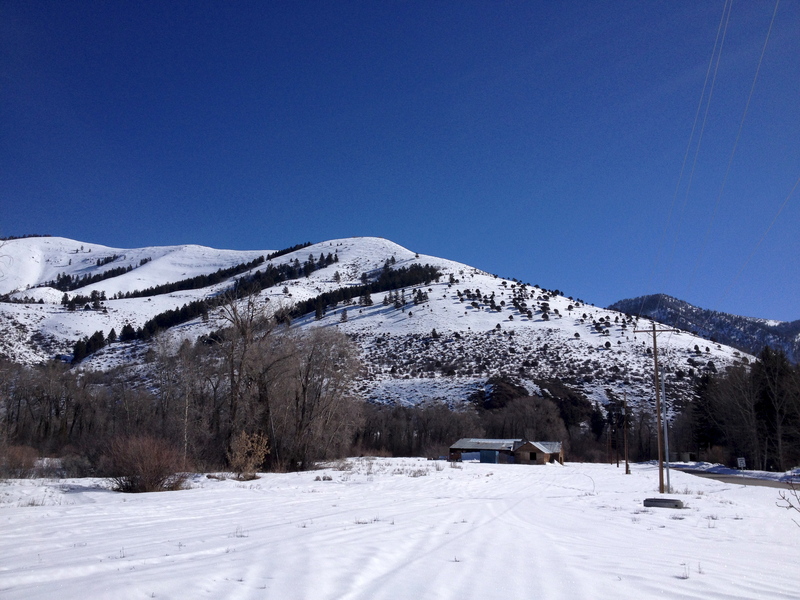 A few days ago it was a day to work on the book, but when I woke up it was a bluebird day. I couldn’t stay inside, but I couldn’t take the whole day to drive to the Tetons either. In the summer I can hike Star Hill. It’s a hill right behind the house where high school seniors maintain a big white star for “Star Valley” instead of the school initials. It rises about 1400 ft right behind the house in Afton. Maybe it is skiable? Star Hill. The building in the foreground is Stormy’s grandfather’s old sawmill. As I headed up I saw a some tracks. A few people had hiked part way up when the snow was frozen, but about a third of the way up the hill they had turned back. Above that point the only tracks I saw were from the rabbits, and the deer that wander through Afton during the day and sleep on Star Hill at night. Animal tracks on the way up Star Hill. The top is in the distance. It’s been in the 40’s in Afton during the day, but the morning before I climbed it was clear and cold. When I started climbing it was about 15º F so the snow surface was a hard sun crust. I thought the skiing would be horrible, but it turned out to be great. A little surface hoar had formed and it was just enough to hold an edge. About fifty minutes of climbing turned into a ten minute descent. If you backcountry ski, you have to like the ‘up’ at least as much as the ‘down’. I was back at the house and working on the book within a hour and a half of leaving the house. I’ve skied it every day I’ve been at the house since then. Unfortunately, the snow is going fast so I don’t think I’ll be able to do it again. 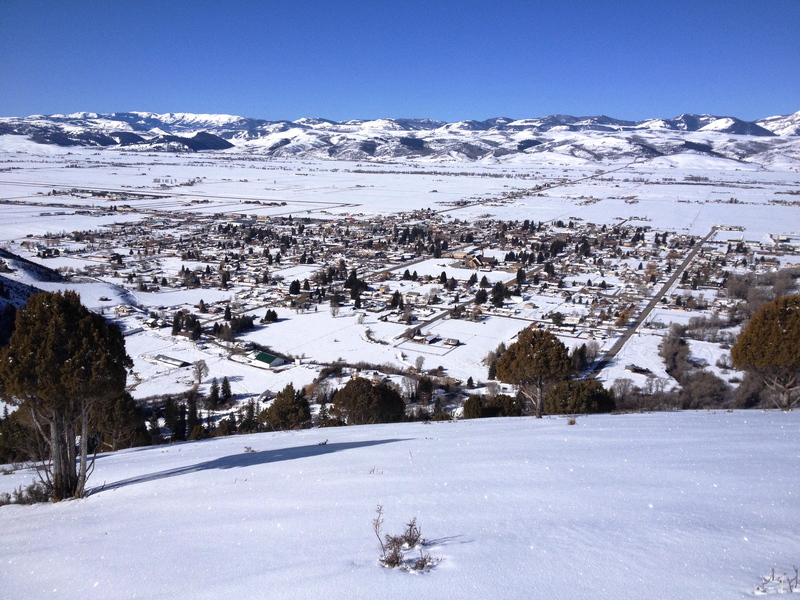 A view of Afton from about half way up Star Hill. It looks so beautiful in your great photos. I will be there on Sunday. Hold on to some snow for me — but give me some sun too. “Enjoying the up as much as the down.” Sounds like a phrase one could use concerning all of life, eh? Beautiful shot from on top! I hadn’t thought of it that way, but it is a good way to think about life. 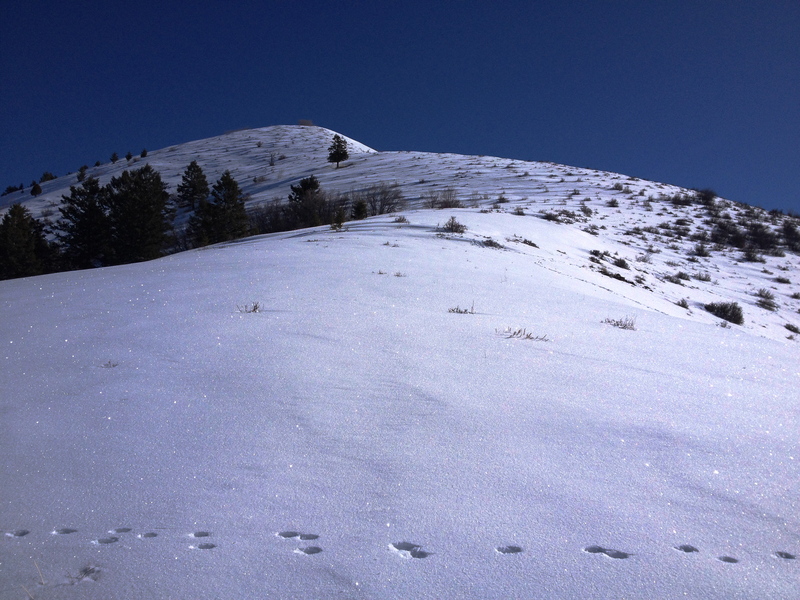 This entry was posted on March 19, 2014 by shane and tagged backcountry skiing, Star Valley, wyoming.